A guide to the United Kingdom’s truly exemplary, organic, sustainable, and ethical restaurants. Truth, Love & Clean Cutlery: A Guide to the Truly Good Restaurants and Food Experiences of the United Kingdom is part of a series of the world’s first guides to truly exemplary, organic, sustainable, and ethical restaurants. Edited by Giles Coren, the guide features 272 inspirational restaurants from around the United Kingdom so you can easily find exemplar restaurants near you, and enjoy sustainable, ethical and simply good food. 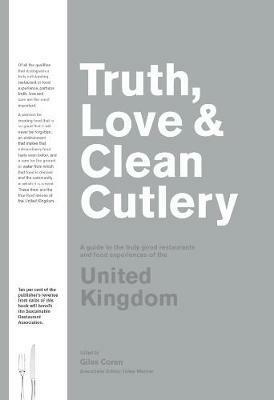 Also accompanied by an easy-to-use mobile-optimised website highlighting inspiring exemplar restaurants www.truthloveandcleancutlery.com. Ten per cent of the publisher’s revenue from sales of the Truth, Love & Clean Cutlery UK guidebook will benefit the Sustainable Restaurants Association, a not-for-profit social enterprise, which aids food-service businesses to work towards sustainability and guides customers towards more sustainable choices. The SRA will use this money to support its One Planet Plate campaign, helping diners use the power of their appetites wisely.